Preheat the oven to 180°C/350°F. In a bowl, roughly mash the ripe bananas and set aside. Line a muffin tin with paper liners for 12 muffins. Rougly chop walnuts and set aside. In a large bowl, combine brown sugar, eggs, and melted butter. Whisk until the mixture is fluffy and the sugar is almost dissolved. Add vanilla extract and gently fold in mashed bananas. In another bowl, combine the flour, ground hazelnuts, baking soda, baking powder, and sea salt. Add the flour mixture to the banana mixture. Gently fold but don’t whisk–the batter should be rather chunky instead of smooth. 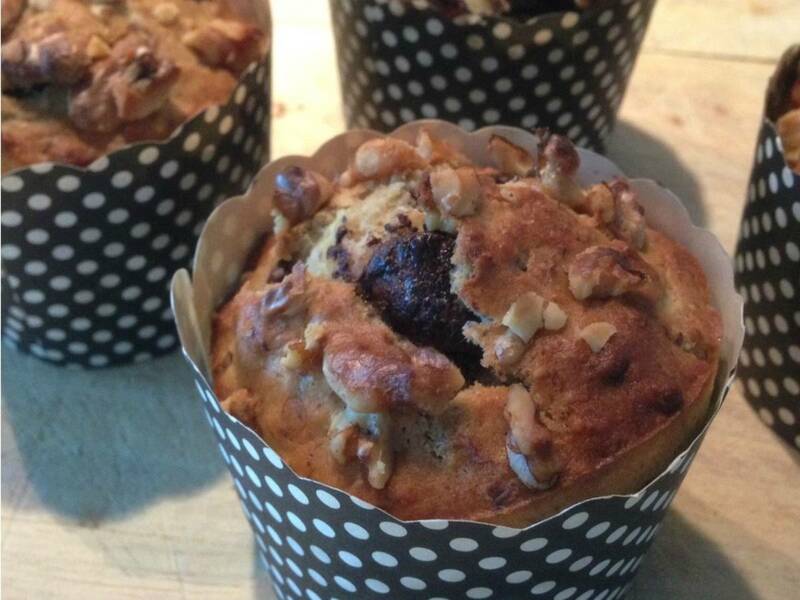 Now add two-thirds of the chopped walnuts and all the chocolate chips, if you like the muffins a bit sweeter. Fill batter into the paper liners and sprinkle with remaining walnuts. Bake at 180°C/350°F for approx. 25 min. or until a skewer inserted into the muffins comes out clean. Remove the muffins from the oven and let them rest for at least 10 min. before serving. Enjoy!